1. Sam was getting a root canal the other day. I sent him a text to let him know I was going to be in my Zumba class. I figured this was the best way to break it to him. 2. We love our pop tarts. 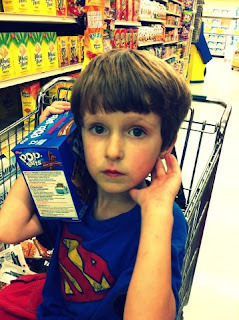 So much that when Kid B saw them in the store, he brought them to his face and snuggled them against his cheek. Fighting the waif look one box at a time. 3. 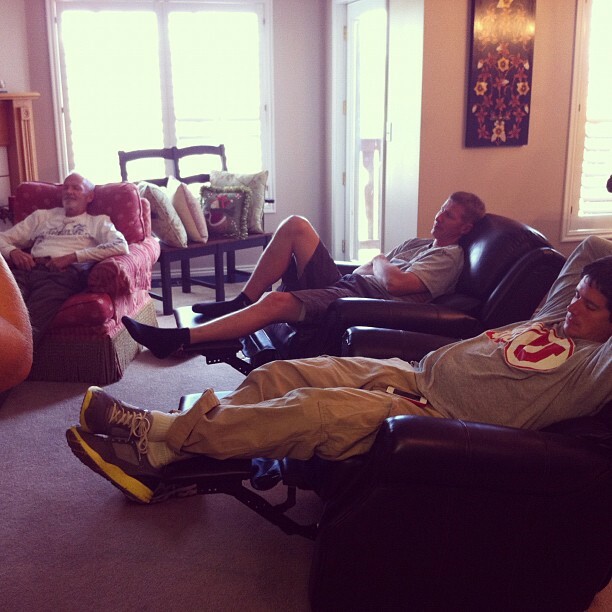 Yesterday my family got together to watch our church's general conference. 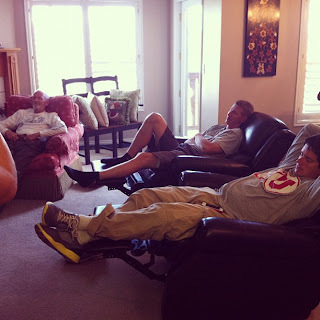 The men in were captivated. I can hear better with my eyes closed too. 4. 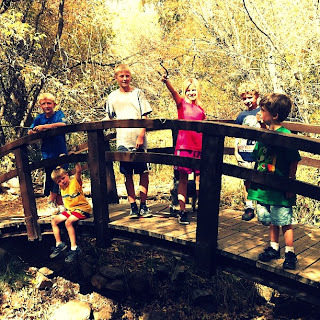 Do kids ever look cuter than when they are on a bridge in the mountains? They're cute until you realize that Necie (the lone girl) is triumphantly displaying the snake she just killed. Kidding. Book Queen- I know! Maybe the autocorrect really knows me, and was all, "Chances are better she's in Zimbabwe than actually working out." Had a similar experience listening to Conference. Zumba classes are the best! Ha ha! I love autocorrect. How was your trip to Zimbabwe? Nicole- They are awesome! I'm finally starting to learn the steps and not feel like such a doofus all the time. Jenni- It was great! Although I'm still sore. I watched conference yesterday with my little family, 4 missionaries, and an investigator who's set for baptism. Boy was I smug when they were talking about missionary work! Found the best way to get my kids to listen to conference. Trap them in the car for two hours and they have no choice. Seatbelts aren't only for safety. My husband texted someone the other day and it auto-corrected to Mexican ball cheese. Now we can't stop saying it. Robin- Did you stand up and yell, "Boo Yah!! In your face!" Dorien- Don't even get me started on the kids. They never understand the gravity of the day. Haha this really made me laugh, I really love the pictures! My weekend consisted of drinking too much, and not enough sleep. Already paying for it. I never seem to get enough sleep and anytime you sit me down for 30 minutes, let alone two hours, I want to fall asleep. But I made it all four session. I only missed one talk as I scrubbed the permanent marker drawings my kids made out of my parents table. Oxyclean- whodda thunk? Hope you had fun in Zimbabwe. :) I've been to Ghana, but I've always wanted to try another African country. And kids are ALWAYS cuter on a bridge. Ha! Great post. It's those deep, soothing voices. They always make my sleepy, too. Love the mountain pic. Kristin- Zimbabwe is beautiful this time of year. But there was a lot of loud latin music going on. Weird. Shelly- That's good to know about the oxyclean! My kids are obsessed with sharpies. Shallee- You've really been to Ghana? You are an adventurer! Jessie- I want to know where I can get one of those deep soothing voices. I wanna sound like Barry White.